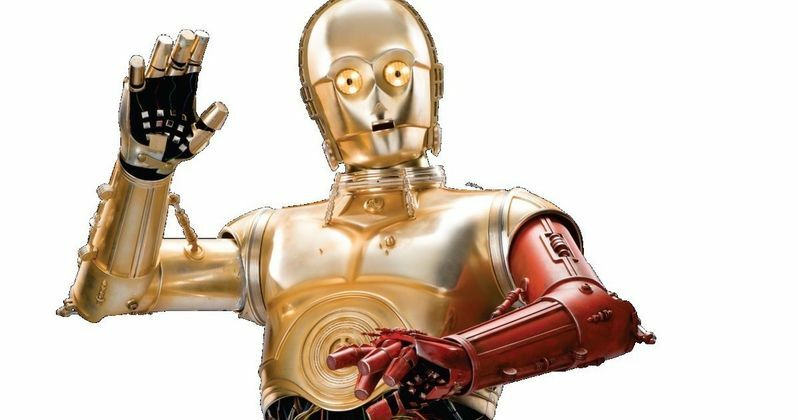 How Did C-3PO Get His Red Arm in Star Wars: The Force Awakens? Star Wars: The Force Awakens is a movie shrouded in mystery. And we sure hope that Star Wars: Episode VIII answers some of these questions that have arisen. One of the many unknown backstories is how C-3PO got his new red arm. While this won't be touched upon in the upcoming sequels, the full answer will be revealed in a Marvel comic book releasing next year. But now we have more insight into this unique appendage. A page from an upcoming Star Wars 7 companion book has arrived. And it holds some of the answer. It seems this new red arm emerged from some sort of droid sacrifice. The passage about the arm reads as such. "C-3PO is uncharacteristically quiet when it comes to discussing his salvaged arm; it is a memento of another droid's sacrifice." In The Force Awakens, the protocol droid does acknowledge that he has a brand new arm. When first being reunited with Han Solo after many years, he says, "You probably don't recognize me with my red arm." It's then never mentioned again. Some fans have been dying to get an explanation to fill in the blank. Now we know a little more about the backstory. But what happened? Why did one droid have to sacrifice himself to save C-3PO? As with Star Wars: The Force Awakens itself, one answer only opens up another pandora's box of questions. The new companion book reveals that C-3PO has also gotten a language update since we last saw him. "C-3PO has upgraded his TranLang III communications package to increase his language fluency to over seven million forms of communication." Leading up to the release of Star Wars: The Force Awakens, J.J. Abrams revealed that he wanted C-3PO to have some sort of physical change to help signify the passing of time. We haven't seen the droid in 32 years. And within the span of time we previously spent with him, he has endured plenty of mishaps, including being completely blown apart by Ugnaughts. And when we were first introduced to him in A New Hope, he had a silver leg, which was never explained by that movie. C-3PO doesn't get a lot of screen time in Star Wars: The Force Awakens, and at a swift two hours and sixteen minutes, there really isn't a moment to spar in giving it over to the droid in explaining what he's been through the past several years. At this point, the protocol droid, who was built by a young Anakin Skywalker, is severally outdated. And it's probably a little hard to come by spare parts. Though why the arm wasn't dipped in gold to match the rest of his body may be explained by the fact that Threepio sees it as a memorial that he doesn't want altered. Marvel's C-3PO one-shot comic, written by James Robinson and illustrated by Tony Harris, will be in stores February 24.